90 Items. Showing Items 73 thru 90. This pattern features 20 sheep and rams, a border collie to keep them in line & watch over them, a fence to border the field of crazy quilt scraps, and four faces (for the cornerstones of a quilt). This bag pattern wil give you the instructions to make the felted Sheep Faces and to make the bag ...a technique and a use. You could also make a small wall quilt using just the Sheep Faces. Needle Felted Appliques in an animal themed quilt. Here everybody wants to be a sheep. 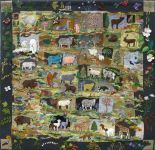 There are 56 critters in this quilt, but only 17 are sheep. The other 39 critters secretly desire to be sheep. Sixteen pampered pooches are included in the pattern for raw edge machine applique. There are complete instructions for all the sewing techniques and full sized drawings. Small Forest Critters is all done in Raw Edge applique technique. If you hate applique, we are out to convince you that applique is fun. There are 26 drawings for machine applique in this pattern, including a family of quail, a mule, lots of different cactus, a roader runner, two rattlesnakes, a badger, a pony, an armadillo, and a red fox among them. A finished quilt made from this pattern is available to purchase. Email us at info@critterpat.com for details. 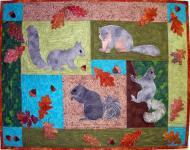 There are four squirrels and two different oak leaves and two acorns for accent. The techniques used are satin stitching and raw edge applique. All our patterns explain how to sign your name on the sewing machine and how to quilt and sew on the binding. 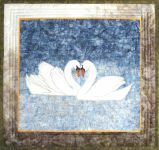 In this pattern for fusible raw edge applique, there are full sized drawings of a pair of Swans. There are 20 teddies sitting, standing, walking, and lying down in this printed . One is even having a tantrum! We also included two sizes of hearts for accent. Sure to grab your heart! There are 17 cats and kittens, and 21 friends such as birds, fish, mice and butterflies in this pattern, which includes gold lamé for the eyes of the cats. Twenty complete drawings of cats are included with this pattern, so you can arrange them however you like. They are placed in a book shelf scene which requires three different background fabrics going from dark to light and then you coordinate them with a border fabric. Thirty fish, two kinds of jelly fish, many corals, octopus, sponges, a sea horse and a turtle. The instructions for this pattern explain how to add 3-D effects, in addition to the basic directions. Silver lamé is included for the eyes and some small fish. Four turtles: a sea turtle, a river turtle, a box turtle, and a land turtle. There are also instructions on machine stitching a fern. Water Fowl includes birds that live on or near water. I've included sea gulls, an eagle with a 3-D wing, flamingos with 3-D wing feathers, a pelican, a loon, a heron, ducks, a snow goose and a Canada goose, and flying ibises. All the flippers and tails of the thirteen whales stand out from the background. Also, 3-D corals, clam and starfish. Great use for UltraSuede® scraps. The background for the ocean was a fabric that changed color from one side to the other, light to dark. This quilt measures 35" x 44". There are six wolves drawings and thread painting is the technique explored here to make the wolves look real. Needle Felted Appliques in an Alphabet themed quilt. 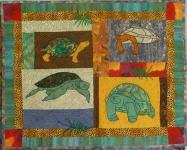 This pattern and quilt are a huge variation on Critters' Alphabet pattern. 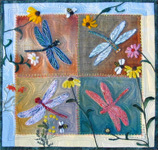 I have added a new technique: felted applique, and many new critters, a whole new layout, and a new border.